It's been 50 years since Silentaire Compressors went on the market and all this while the company has refined and improved the performance capabilities and quality of its products. 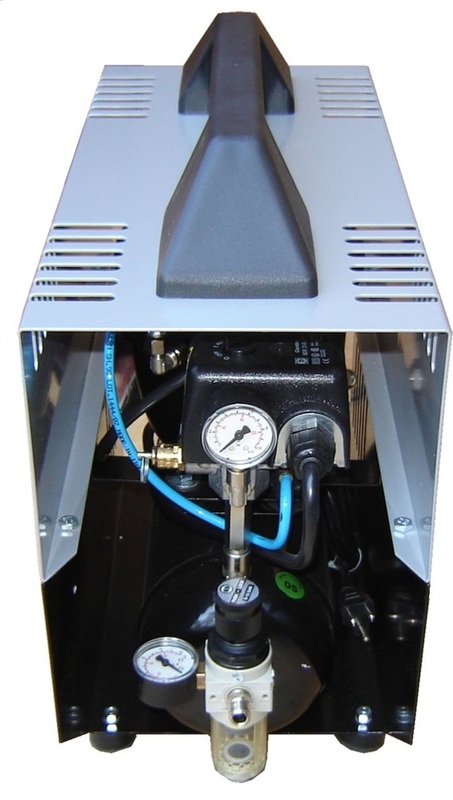 That's why Silentaire Compressors have quickly gained their popularity among many airbrush artists around the world. As one of the largest manufacturers in the industry, the company can offer the complete line of compressor models. This includes more than 100 different designs so you can surely find the right Super Silent compressor to your requirements and budget. Besides, these state-of-the-art Italian-made airbrush compressors are absolutely reliable and virtually trouble-free compressed air units. They provide a quiet operation while giving you a sufficient power for your airbrush projects. and a carrying handle for easy portability. 110 Volt / 60 Hz motor providing 1/5 HP. Notwithstanding their multiple applications and extremely powerful operation, the Silentaire DR-150 Oil Lubricated Compressors stay practically noiseless and totally automatic. The manufacturers managed to create a sturdy highly efficient compressor while offering maximum user comfort and protection. Given that the compressor weighs 42 lbs and has a comfortable carrying handle, it's possible to say that it also provides an excellent mobility. In point of fact, many users note that there's nothing to say wrong about this compressor. Using it, you can perform several jobs. Whether you need to work on fine details or cover a large surface, the compressor can be of help for small and big projects alike. Along with that, its whisper quiet operation enables you to work during late hours without disturbing other people. And what's more important, this DR-150 compressor ensures flawless functioning and accurate results. In addition to everything else, the Silentaire DR-150 Compressor includes a 12-months guarantee which starts upon purchase. If the manufacturer recognizes parts as defective, they will be freely replaced. Please note, this does not regard the electric and worn parts. In case of tampering or bad usage, the guarantee also ceases.